Somebody once gave me a book listing all the things you should do before you die. I've always thought those checklists ridiculous; they serve only to remind you of a squandered youth and of all the things you must squash into your mediocre life in the next 50 years, so you don't lament on your death bed that you never climbed Everest or chained yourself to a rainforest. But I couldn't help thinking about the book as I rode my very first roller coaster at the grand old age of 32. Strapped into a padded straitjacket of a seat, palms sweaty, eyes boggling as we ascended a 140ft rise, I gibbered: "How about 'Things To Do As You Die'?" The previous day, I had taken a sort of dress rehearsal at Universal Studios in Orlando. Universal's two main theme parks -- Universal Studios and Islands of Adventure -- are prime destinations for coaster addicts, who pile on to rides such as Revenge of the Mummy and the Incredible Hulk Coaster. 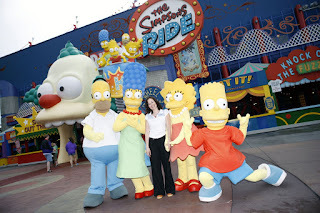 Try The Simpsons ride, I was told; it will give you sea legs. The Simpsons is a motion simulator that uses CGI animation on surround screens to fool the brain into thinking the body's on a wild ride. It is enormous fun and you get thrown around a bit, but in terms of breaking virgin territory for me, it merely reaches first base, as a Floridian might say. I was saving myself for Manta. This is the monster new roller coaster just unveiled by SeaWorld Orlando, their first new thrill ride in nine years. Fact fans will want to know that it maxes out at speeds of 56mph, has four inversions (where the coaster cars travel on the underside of the track) and a descent that plunges riders within three feet of the water below. All I wanted to know was if I would die. "Of course not, sweetheart," said Lynne, the middle-aged English lady next to me, as we were locked and loaded into the great hunk of metal that is Manta. Lynne, a roller-coaster veteran, was at a loss as to how someone could have entered their 30s and never been on one. "We don't have coasters in Ireland," I explained, "We have see-saws." As if Manta heard me, our seats began to tilt forward until we were suspended face-down, feet and hands dangling like useless puppets. Then we were off; climbing, climbing, climbing over the heads of the queue below us. The advice to not look down is no use as you watch the ground retreat in an alarming fashion. The tension is so heart-bursting that the sudden plunge over the first loop is a blessed, if stomach-churning, relief. We corkscrew through turns, skim tree tops and a waterfall, and invert into a pretzel loop until the G-force puffs out my cheeks. But there is a real beauty to Manta, too. Situated in the very heart of the SeaWorld park, it was designed to emulate the graceful flight of the manta ray through the ocean. The queue for the ride snakes through a peaceful grotto, where riders can say hey to the ray as real mantas glide above their heads in a purpose-built aquarium. 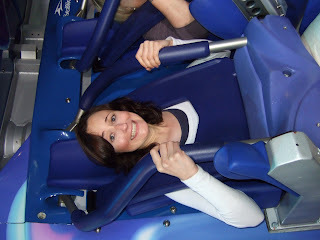 And once you've settled into the ride itself, the most intense feeling descends -- a sense of weightlessness, of gliding and soaring as a bird (or manta!) would. Unlike most roller coasters, the ominous clanking of metal on metal is muffled here, because the engineers cleverly filled the supports with sand. Manta is only two minutes and 35 seconds long, but I am completely spaced out when I disembark. I'm elated, my knees are knocking and my heart is pounding -- it may be that I'm in love. I get straight back on for a second go. I also flirt briefly with another new ride opening this summer on Orlando's 'roller coast' -- the Hollywood Rip Ride Rockit. It is launched this month at Universal Studios, but I had a sneak preview and can report that it looks terrifyingly brilliant. It is being billed as the world's most technologically advanced ride: you can select your own soundtrack to blast from your stereo-fitted chair, then 'rip' a music video of the entire trip afterwards, thanks to cameras located on the ride itself. However, you might not want to see your face as the Rockit catapults through several original moves, including the treble clef, the jump cut and the double take (try watching on www.hollywoodripriderockit.com, if you're brave enough!). Orlando is the ultimate playground, and the choice of parks can seem almost overwhelming. An excellent deal is to buy the Orlando FlexTicket, which gives you unlimited access for 14 days to the two Universal parks and SeaWorld -- which also houses the famous Shamu killer whale show, Believe, and the two immense waterparks, Aquatica and Wet 'n' Wild, with the option to add a sixth, Busch Gardens, in Tampa Bay. But there is only so much adrenaline a girl can produce in a day, so I took to Universal's CityWalk venue for the evening, just a free water-taxi ride from any of their resorts or on-park hotels. If the parks are chock-full of children and their parents, CityWalk is the adults' fairground. It is peppered with restaurants, themed bars and clubs and an X-Factor-style karaoke venue called Rising Star, where the less retiring members of our party performed their party pieces to a full backing band. 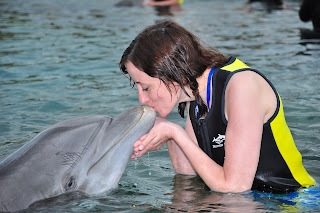 I reserved my energy for my following day's appointment with Dixie the dolphin at Discovery Cove, a short taxi ride north of the Universal parks. I have always wanted to swim with these gentle creatures, and Dixie's caretaker taught me the hand signals to communicate with her loveable charge. She gave me a kiss, I gave her a fish. Two of life's ambitions fulfilled in as many days? Take that, Things To Do Before I Die. The oldest: Leap-the-Dips, Lakemont Park, Altoona, Pennsylvania, US. Built in 1902, this is the oldest wooden roller coaster still in operation in the world with a -- brace yourself -- 9ft drop and top speed of 10mph. The fastest: Kingda Ka at Six Flags Great Adventure in New Jersey. This is more like it -- this monster accelerates to 128mph in 3.5 seconds and boasts a 456ft drop. The longest: Steel Dragon at Nagashima Spa Land in Nagashima, Japan. The ride takes four minutes -- a long time on a coaster -- because the track is 8,133ft long. It reaches 95mph and rises 318ft. First duelling inverted: Duelling Dragons at Universal Islands of Adventure, Orlando, Florida. This crazy beast has two roller coasters zooming within inches of each other at 55mph. Riders on opposing tracks come screamingly face-to-face at several points on the track. The fastest-accelerating: Ring Racer at Nürburgring Race Track in Nürburg, Germany. This one is due to open this year, but is worth a mention because it will use an F1 Thrust Air compressor to accelerate from 0-135mph in 2.5 seconds. Go F1gure. The most: Cedar Point, Ohio. Holding the world record for most coasters in a single park, Cedar Point (left) has amassed 17 in the past decade. If you've had your stomach's fill of roller rides, there are also a record-breaking 75 carnival rides to relax on. Aer Lingus (0818 365 000; www.aerlingus.com) operates three flights a week direct from Dublin to Orlando on Tuesdays, Thursdays and Saturdays. One-way fares start from €259, including taxes and charges. The Orlando FlexTicket, for 14 days' unlimited access to five parks, can be bought online at www.orlandoflexticket.ie for €178 per adult and slightly less for children. I stayed at the mind-blowing Loews Portofino Bay Hotel (001 407 503 1000; www.loewshotels.com), modelled on the real village of Portofino in Italy (pictured below). The story goes that Steven Spielberg holidayed in Portofino and loved it so much that he suggested Universal build a replica. It isn't cheap -- a double room can cost from €250 -- but ask about long-stay discounts and other offers. There are several other fantastic hotels on the Universal site, including the Hard Rock Hotel and the Loews Royal Pacific Resort. If you browse for a package (www.americanholidays. com, www.americansky.ie, www.touramerica.ie, www.ebookers.ie) and stay off-park, check that your hotel offers free resort shuttle buses as an incentive. The price range across the eateries in the Universal parks is mercifully broad, depending on whether you're eating fast or fabulous. A reasonable option is Mythos in the Islands of Adventure -- it is housed in a Flintstones-style cavern and has been voted best theme- park restaurant in the world for the past five years. I also loved the weird sensation of eating fine seafood in Sharks Underwater Grill at Seaworld, as barracudas, sharks and moray eels eyed me reproachfully through the giant glass windows of the aquarium. Predictably, theme parks in Orlando are busiest during school holidays: Easter; July and August; and the October mid-term break. June is hurricane season, so give that a miss. September to November is a much more pleasant (and less crowded) time in terms of temperature and humidity, as is March to May.